Slice it up however you want, the Florida Gators secondary is thin. In fact, they may be looking at ‘thin’ in the rear-view mirror. With the loss of sophomore cornerback Marco Wilson in last Saturday’s game against Kentucky, Florida is down to four scholarship cornerbacks: CJ Henderson, Brian Edwards, C.J. McWilliams and Trey Dean III. McWilliams has missed the first two games due to injury and Edwards was suspended for the opener while only playing two snaps against Kentucky. Couple those events with the loss of signee Randy Russell (heart condition), Justin Watkins (arrest followed by dismissal from the program) and McArthur Burnett (transferred) before the season began and the word “thin” may not even be doing the situation justice. Where will the Florida coaching staff turn to for answers? PFF’s feature on Florida is brought to you by Eckrich, the Official Smoked Sausage of the Florida Gators. 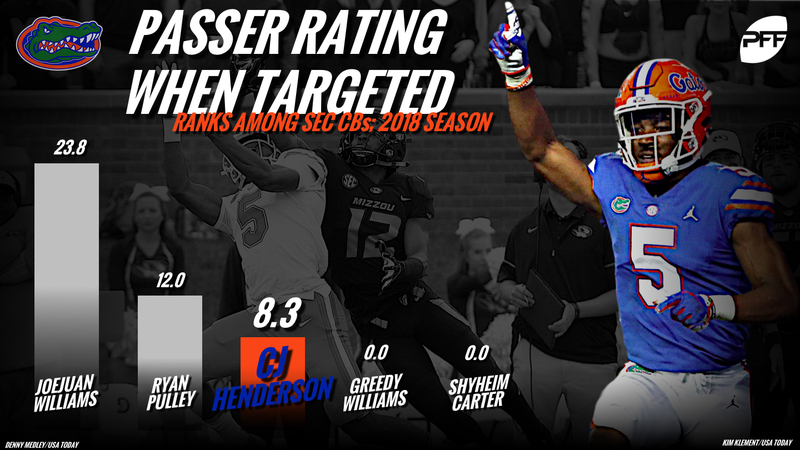 The main man is now CJ Henderson who has performed admirably thus far this season, as he has posted an 88.5 coverage grade and an 8.3 passer rating when targeted through two games, which ranks 14th among FBS cornerbacks with at least 30 coverage snaps. In coverage, he has only been targeted five times and has allowed two catches for no yards. Next is Trey Dean III, a former 4-star recruit and true freshman from Hampton, Georgia. Dean will slide in opposite Henderson and attempt to hold down the other boundary. Through two games, Dean has been steady, dropping into coverage 26 times and seeing two targets, allowing just one catch for 16 yards. Another playmaker in the secondary is Chauncey Gardner-Johnson who isn’t listed at cornerback, but rather the “star” position on the depth chart, which at UF means he covers the opposing slot receiver when in coverage. Gardner-Johnson has seen 25 snaps in the slot so far and has held his own, posting a 56.3 passer rating, 0.20 yards per cover snap and has allowed only one catch for five yards. As previously mentioned, McWilliams and Edwards have made little impact, but both are now expected to take on greater roles in the Florida secondary. Jeawon Taylor and Donovan Stiner are two additional names to watch for, as they hold down the deep middle of the field at the safety position. The Gators host Colorado State this coming weekend in a game set up as part of former head coach Jim McElwain’s buyout (Florida is paying Colorado State a mere $2-million dollars to play this game). Colorado State is a formidable foe and the Gators need to come prepared to play or they will be looking at a two-game losing streak. Just like clockwork, the new-look Gator’s secondary will get an immediate test against two veteran receivers. Redshirt junior Preston Williams sat out all last season after transferring from Tennessee but has made an immediate impact for the Rams. Through three games, he has seen 46 targets from QB K.J. Carta-Samuels, resulting in 391 yards and four touchdowns with a 106.3 passer rating when targeted and an 80.4 receiving grade. Olabisi Johnson has been no slouch either, garnering 22 targets with 286 yards and three touchdowns and a 139.2 passer rating as well. It’s also worth mentioning that both receivers are averaging over 14 yards per reception. If Henderson and Dean cannot limit Johnson and Williams in the passing game, it could be a long day for the Gators secondary. Last week, the Florida front seven gave up over 300 yards rushing as they often looked confused and misaligned with numerous blown assignments and 12 total missed tackles. Cue David Reese. All spring and summer, Reese had been the middle-man for the Florida defense and their emotional and vocal leader. Last season, Reese had a 78.2 run-defense grade while leading the team with 82 tackles. He has yet to play this season due to injury but is expected to return against the Rams and it couldn’t come at a better time. The Rams boast not one, but two capable running backs in Izzy Matthews and Marcus McElroy. Matthews has seen the bulk of the snaps (43) and is averaging 3.1 yards per attempt with four runs of 10-plus yards and seven avoided tackles. McElroy is averaging 4.5 yards per attempt and 3.11 yards after contact per attempt with four runs of 10-plus yards as well. Reese patrolling the middle of the field is a huge factor in this game.